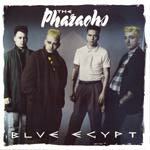 Aside from some very cool British psychobilly tracks like an insane "Wild Thing" (Troggs), "Radar Love" (Golden Earring), "Down The Line" (Roy Orbison), and a slab of rockin' originals, the Pharaohs cut a very cool surfabilly instro on this 12 inch release. Tribal rolling drums and a cool melody riff writhe with twang. The arrangement definitely straddles the line between surf and psychobilly, without sacrificing either. There are references to spaghetti western and adventure themes in the writing. An excellent track.